Please help our community — upload your photos of 25168719. This is a pump, fuel (electric) (has radio frequency interference filter & connect to adapt old terminal to new terminal on pump, except strainer) (acdelco #ep386), for Chevrolet, Chevrolet Trucks, Buick, Oldsmobile Trucks, Pontiac, Oldsmobile, Cadillac, and GMC Trucks automobiles. It fits for 176 General Motors vehicles which were sold in the U.S. from 1980 to 1996. It's a genuine General Motors merchendise product with an OEM part number 25168719, and corresponding ACDelco part number EP386. This pump has dimensions 3.30 in × 6.80 in × 4.30 in, it has a weight of 12.32 ounces, usually, it comes in a set of 1 item in retail packaging. Bulk packaging options for wholesale buyers are also available and include as follows: a cardboard box of 12 units (UPC-A: 40036666105269), and a pallet of 45 cardboard boxes with a total of 540 units and a weight of 416.00 pounds (UPC-A: 60036666105263). In spite of higher price of genuine merchendise products buying this pump will be a smart decision because you will be absolutely sure that it will serve you longer and will provide maximum safety and performance for your car. This pump comes in retail packaging with dimensions of 6.80 in × 4.30 in × 3.30 in and weight of 12.32 ounces. Carton packaging contains 12 units in retail packaging and has a UPCA code 40036666105269. Pallet packaging contains 540 units in retail packaging, has a UPCA code 60036666105263 and has a weight of 416.00 pounds. All the data on these charts reflect users search interest in GM 25168719 part based on search requests on oemcats.com website made between 2012 and 2018 years. Search interest in GM 25168719 part aggregated by months over time. 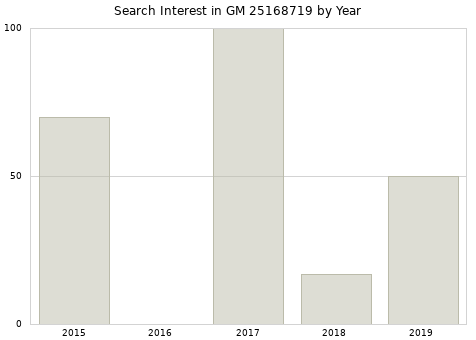 Monthly average search interest in GM 25168719 part over years from 2013 to 2018. 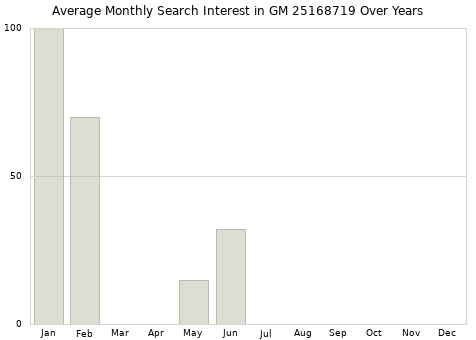 Annual search interest in GM 25168719 part. 06471924 was replaced with 06472011 on April 1, 1982 for the U.S. market.